Sources said the Congress leaders are divided on the issue, as a group within feels that the Goods and Services Tax (GST) was the party's brainchild which has been now taken over by the ruling BJP. Therefore, they feel, the party should attend the special meeting convened in the central hall of Parliament to launch the GST. The GST or Goods and Services Tax will be enforced across India from July 1. 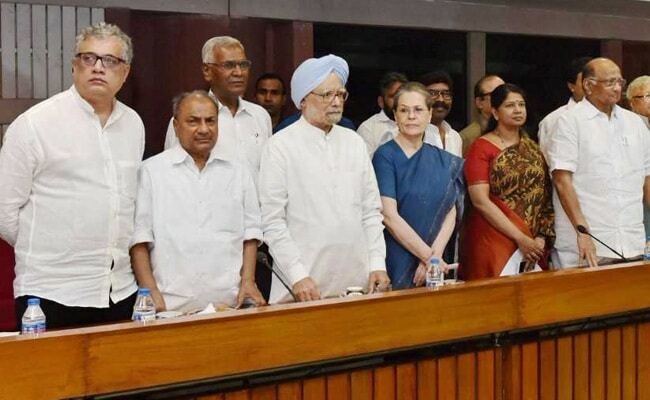 New Delhi: Suspense continued on Tuesday over the participation of the Congress in the June 30 midnight meeting in Parliament to coincide with the launch of GST, with the main opposition party likely to decide on the issue today. According to a senior Congress leader, the party would discuss the issue at a meeting slated in the evening today to arrive at a decision on whether to participate in the event. However, some leaders feel that the GST is being implemented in a haste and all aspects have not been taken into consideration leading to harassment of small traders and businessmen and thus, the party should abstain. At the AICC briefing, party spokesperson Shaktisinh Gohil said the Modi government is using GST to spread "tax terrorism", whereas the Congress conceptualised the move to simplify the tax regime for small traders and businessmen. "Our leaders are talking to experts, businessmen and common people and are examining the issue. We will talk to all and discuss with experts and then take a final decision," Mr Gohil said. "Businessmen from Modi's home state of Gujarat who were earlier his loyalists feel that GST will lead to 'tax terrorism'. The prime minister should at least hear them out," he said. Apart from holding its meeting today, the Congress is also seeking views of other like-minded parties on the issue and is also likely to hold consultations with them. Other opposition parties, including the Left parties, are also yet to decide on whether to participate in the event. As per earlier reports, former prime ministers Manmohan Singh and HD Deve Gowda are expected to share the dais with incumbent Narendra Modi. The historic Central Hall of Parliament will host a midnight function on June 30 to launch the sweeping tax reform measure, reminiscent of India's tryst with destiny on the midnight of August 15, 1947. The government will use the circular-shaped Central Hall, perhaps for the first time, to launch a new taxation system that is set to dramatically re-shape the over USD 2 trillion economy. A gong will be sounded at midnight to signify that GST has arrived. PM Modi will be the key speaker at the function. President Pranab Mukherjee is also likely to attend the function. The GST Bill was originally piloted by Mr Mukherjee when he was the finance minister in the previous UPA regime.